Serving our community since 1971, Billy's Pancake House Restaurant specializes in serving the most appetizing breakfast and lunch selections anywhere. If you're hungry for a traditional favorite, try our Hearty Two Eggs breakfast, with bacon and toast. Enjoy generous portions of our delicious Ham-off-the-bone. Or if it's an omelette you crave, dive into a satisfyingly fluffy Southwest Omelette, or cross the Atlantic with our Mediterranean Omelette with chopped tomatoes and crumbled imported feta cheese. We offer a full selection of gourmet pancakes and crepes, including our Swedish Pancake, a jumbo classic crepe stuffed with fresh strawberries and bananas, and our signature Apple Pancake, loaded with fresh cinnamon spiced sautéed apples and baked to perfection. 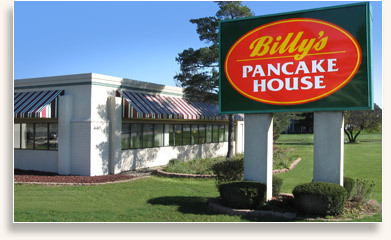 Family owned and operated, the entire staff at Billy’s Pancake House looks forward to serving you seven days a week. Come visit us today for the best breakfast and lunch experience in the area. Gift certificates from Billy's Pancake House make a great gift for friends, family and co-workers. Ask about our gift certificates on your next visit.